How SenseMaking creates learning organizations by effective change programs. The natural approach for effective change programs is full involvement of and guidance by all involved key-players. Combined with a natural learning approach this leads to effective continuous change programs and a learning organization. 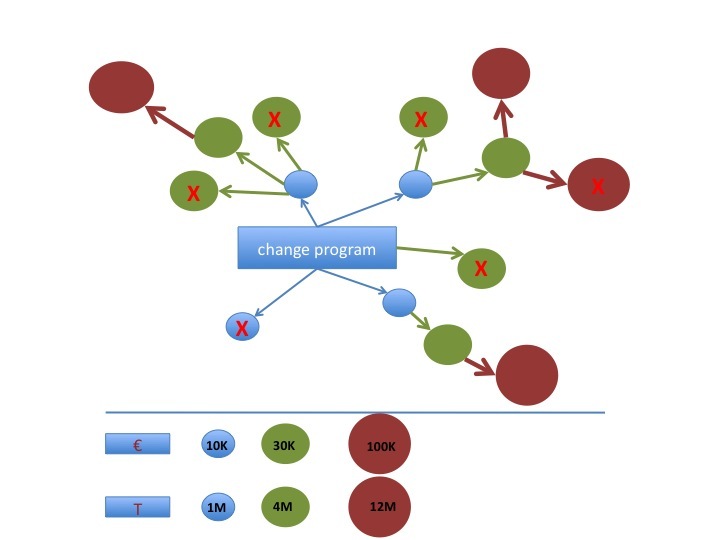 What is different related to old-fashioned centrally and top-down managed change or improvement programs is the emerge of the outcome during execution of the change program. Based on the learning path, new nearby objectives are defined. Sensemaking creates learning organizations in just 6 steps. Use the 6 steps only if your problem belongs to the complex domain. Obvious and complicated problems are bests solved by using standard solving techniques. See the Cynefin model for background information on the different problem domains. SenseMaker® facilitates continuous, small and large scale, fine-tuned listening to all stakeholders (clients, employees, external (non-)experts). The design of SenseMaker is essential for a successful change or improvement program. A correct design ensures that the right information is distilled. An incorrect design provides not the information that the next steps need in order to be effective. It leads to frustrated stakeholders as their voice, thoughts and ideas are not heard or implemented. The initial workshop both validates the SenseMaker design and generates a vision of possible solutions. These possible solutions provide the first steps towards learning. Typically a Cognitive Edge method like Future Backwards is used to facilitate the workshop. The outcome of the initial workshop is used to define a first set of low-key-low -profile experiments. The costs and duration of each experiment is kept to a minimum. None of the experiments is expected to provide an ultimate solution to the problem. Each experiment is described in the form of actions and indicators for feedback-signals that indicate positive or negative change. By generating additional context information, management is able to understand early (weak) signals. In this way initial actions that show promise are extended while negative indicators trigger recovery actions and choose of alternatives approaches. The initial experiments provide learning opportunities. Learning is generated both from the experiments participants and by the feedback loop continuous and real-time generated by all stakeholders using SenseMaker. Outcome of each experiment is evaluated both by means of it’s direct outcome or delivery and by means of the feedback mechanism. Those experiments that both deliver on outcome and receives good feedback are re-evaluated for strengthening and to be continued. Those experiments that fail to deliver are stopped. Notice that learning may trigger new experiments. Step 5 and 6 is a continuous loop. New problems or emerging insights will most likely trigger new experiments. A learning organization is created. The above figure below shows a graphical view on experimentation in a learning organization. In the emerging process of learning, more and more practical knowledge is generated. This enables more stable experiments. By reducing the risks of failing experiments, the size (€) and duration (T).